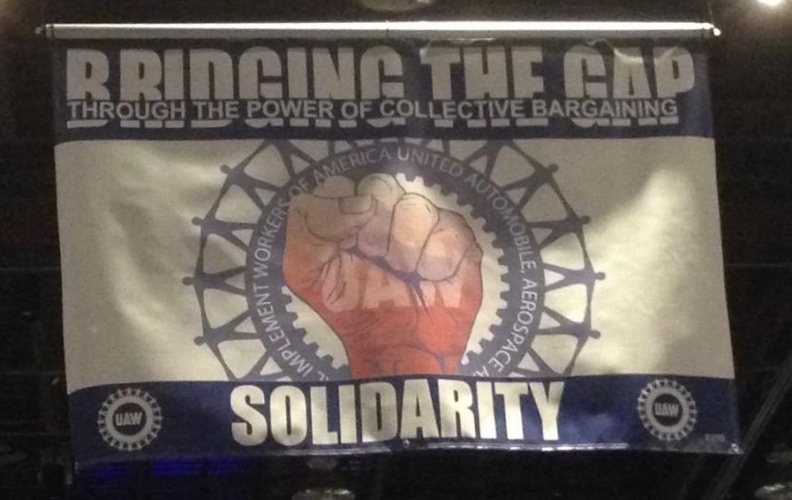 A banner at today's UAW convention. DETROIT -- Opposition to the Tier 2 pay scale is so pervasive at this week’s UAW bargaining convention that the only delegates speaking against a proposal to reduce the pay gap between veteran and entry-level workers at the Detroit 3 are those who want to see it eliminated outright. The hundreds of UAW delegates who have assembled here are sending a clear message to UAW leadership, and Detroit 3 negotiators indirectly, that they want Tier 2 rolled back from the prominent position it has achieved at Detroit 3 factories. The bargaining convention is held every four years prior to Detroit 3 collective bargaining to set negotiating direction and try to unify the rank-and-file going into the talks. The UAW’s four-year contracts with the each of the Detroit 3 expire in September. Delegate Scott Houldieson, newly elected vice president of UAW Local 551 representing workers at Ford’s Chicago assembly plant, said Tier 2 violates the UAW ideal of equal pay for equal work. Under Tier 2, entry-level workers earn roughly half the wages and benefits of long-time auto workers for doing the same tasks as their higher-paid co-workers. Veteran Tier 1 workers are paid wages of about $28 an hour, while Tier 2 workers earn between $15 and $19 an hour, depending on how long they have been with their companies. The Tier 2 pay scale was instituted at Detroit 3 factories in 2007, though it took root in supplier parts plants years before that. UAW President Dennis Williams responded that the union would entertain the amendment Wednesday during the appropriate portion of the convention. “We should all be Tier 1,” Houldieson said on the sidelines of the convention. Parker asked for specific resolution language pledging UAW bargainers to fight for all Tier 2 workers to be promoted to Tier 1 during the upcoming negotiations. But he failed to get 94 delegates to support his proposal to bring it to the floor after UAW Secretary-Treasurer Gary Casteel said it conflicted with other proposal language. Houldieson said nearly 60 percent of the 4,000 hourly workers in Chicago are Tier 2. The plant makes the Ford Explorer SUV, Taurus sedan and Lincoln MKS. Recently, 200-300 Tier 2 workers were promoted to Tier 1 in Chicago after Ford’s Tier 2 work force exceeded 29 percent. Houldieson said fighting for pay equality is worth striking over. But whether a strike is required “will depend on Ford,” he said. Given Ford’s 22 consecutive quarters of profits, the carmaker can afford promoting all workers to Tier 1, Houldieson said. Gary Walkowicz, a bargaining committeeman at Ford’s Dearborn Truck assembly plant, estimates the cost for bringing the company’s 14,685 Tier 2 workers to Tier 1 wages at $335 million -- a fraction of the $6.9 billion in North American profits posted by Ford in 2014. Walkowicz also believes that all workers should have Tier 1 benefits. Is high-paying Tier 1 at risk in UAW talks?